If you want to join the largest social trading and social investment network worldwide with a huge choice of experienced forex and cfd traders you should sign up with eToro. This company was founded in 2006 by CEO Yoni Assia. Here you can trade, invest, discuss and learn from other traders. eToro is more than a usual forex, crypto and cfd broker, it’s a social trading and social investment environment. With one click of a button you can follow your preferred trader(s) and from then on their trades are being copied into your portfolio. The eToro community consists of more than 5 million traders, investors and other people interested in financial markets from 170 countries worldwide. With a single click of a button you can select your trader(s) according to certain criteria such as performance, draw down or absolute profit and thus profit from the knowledge of the best traders worldwide. The eToro Crypto Copyfund consists of the most common and most important crypto currencies at the moment. Nonetheles it is just one of many CopyFunds available on the platform. There might be a delisting of one or more coins in the future as soon as the market cap of a crypto currency drops below $1 billion. The Copy Fund is rebalanced on a regular basis on every first trading day of a new month. At the moment this fund contains almost 600 investors. There is plenty of CopyFunds on eToro in which you can invest. 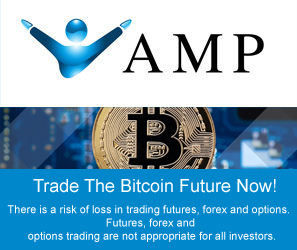 Next to the Crypto CopyFund mentioned above there’s a Top Trader CopyFund which comprises the best performing and most sustainable traders on the platform als well as a Market CopyFund, where stocks, commodities and ETFs are being allocated. CopyFunds help investors to minimize their risk by diversification. Once you invest in a CopyFund the captial is professionally managed by the eToro investment committee who is looking for the best performance possible. Your CopyFund will be rebalanced automatically every month to maximise its performance potential. eToro was the first social trading platform and has an ambitious vision: Make the financial markets accessible to everyone and even to unexperienced people. It stands as a global marketplace where people from accross the world can come together and trade. eToro is designed as an open investment network where anyone can join and contribute their skills to the community. eToro is fully regulated and licensed in Europe (CySec) and Great Britain (eToro UK, FCA). You can use eToro from almost any country worldwide except from the USA. eToro has implemented many tools that will guide you throughout your first steps as a daytrader and help you understanding the power of the leverage effect and the importance of a proper money management. How to make money with eToro? In order to climb the career ladder you just have to convince others to follow your account. This is mainly by trading a reasonable trading style with a proper risk and money management as well as a steady performance curve. If you have no idea of how the markets work you can use the social trading function and build a portfolio of experienced forex-, cfd, stocks and crypto traders. First of all you should observe (follow) some experienced traders and as soon as you are convinced you can have them trade your real money (copy). While following other successful traders you can learn from their strategies and thus become a successful daytrader for yourself. Just study carefully their entries and exits. Take advantage of our righthand side widget in order to pick the best traders at the moment and follow their trades with a single click of a button. Heart of the eToro social trading network is the so called CopyTrader™ which comes as a groundbreaking system that enables you to copy other investors. All you have to do is to pick an investor you want to follow, determine a certain allocation amount of your deposit, decide whether to copy their already open trades or not and click “copy”. Every trade executed by the investor will from now on being mirrored on your account. The managing of stops, take profits and opening of new trades included. Just sit back and relax and watch your trader work. If he or she doesn’t perform properly you can just dismiss them with a single click of a button and go for another one. By means of the people discovery tool you can set up many filter options in order to find the best traders on the network. 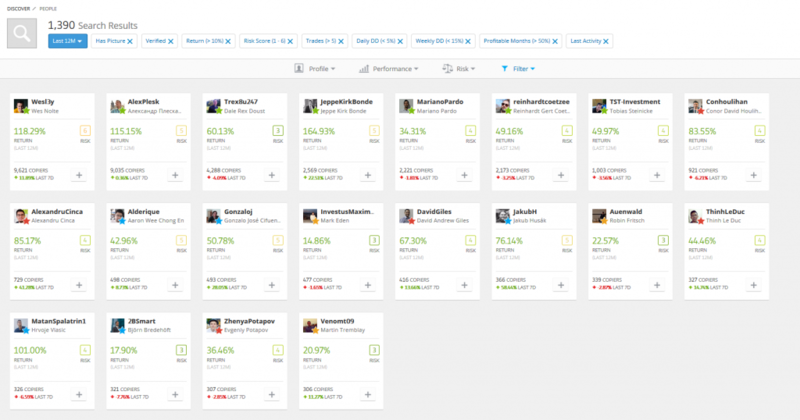 As soon as you are registered on the eToro platfom you will have access to the Top Traders Insight Widget. This live updated widget will be found under “trading tools” and collects data from the top 1000 traders on the network and you can see at a glance who’s worth an investment. This instrument displays as well the top 10 most traded instruments along with a statistics of current Long and Short positions.